Managed Backup service offers a full Managed Backup client rebranding and customization. This allows you to provide an easy-to-use and efficient cloud backup solution under your own brand. Our Managed Backup service has multiple customization features that can make Managed Backup client look fully aligned with your brand. Will be shown in window caption. Note: to prepare an icon you need to have an initial PNG (or other image format) file of sizes 16x16, 32x32, 64x64 and convert them into icon using a special program (e.g. http://www.free-icon-editor.com/). Appears at the application window bottom status bar when new product version is available for download. Shown at the time of product starting. Note: the area marked with red square should be reserved for product information such as build number, license, etc. The bottom panel is reserved for text "Loading..." that is written during the application startup. 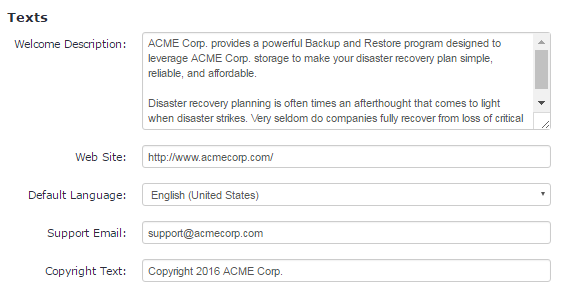 Default: Online Backup provides a powerful Backup and Restore program designed to leverage Amazon S3 storage to make your disaster recovery plan simple, reliable, and affordable. Disaster recovery planning is often times an afterthought that comes to light when disaster strikes. Very seldom do companies fully recover from loss of critical data which could lead to loss of business. - Enable Client Console - this option enables the users to open and use the client console and fully manage their backup/restore plans. If this option is off, the users are not allowed to even launch the client. 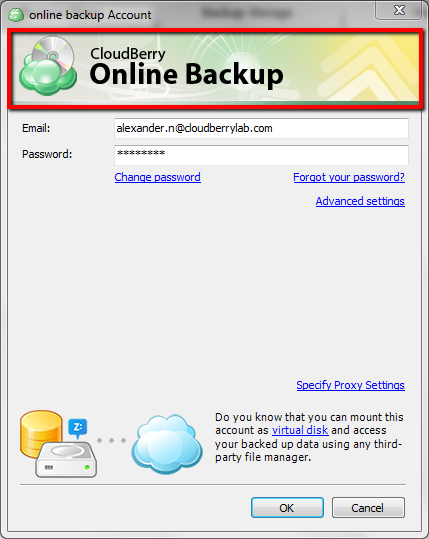 - Enable Local Backup in the console - this option provides your clients with an ability to use their local folders as a storage and allows users to set up and manage a Local Backup the client. - Enable Manual Files Delete - this option enables an ability to delete files from the storage (Backup Storage tab) in the client. 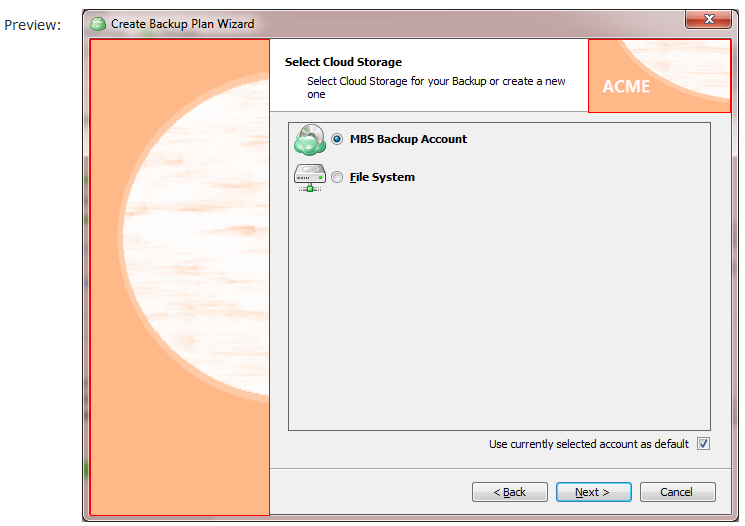 - Enable backup plan edit - this option enables editing backup plans in the client. - Enable restore plan edit - this option enables editing restore plans in the client. - Show Compression option in the console - this option enables Compression option on the client. - Use Compression by default - this option sets Compression as a default setting for your customers. - Show Encryption option in the console - this option enables Encryption option on the client. - Show Filename Encryption option in the console - this option enables Filename Encryption option on the client. - Show SSE option in the console - this option enables SSE (Amazon S3 Server Side Encryption) option on the client. - Use SSE by default - this option sets SSE as a default encryption for your customers. 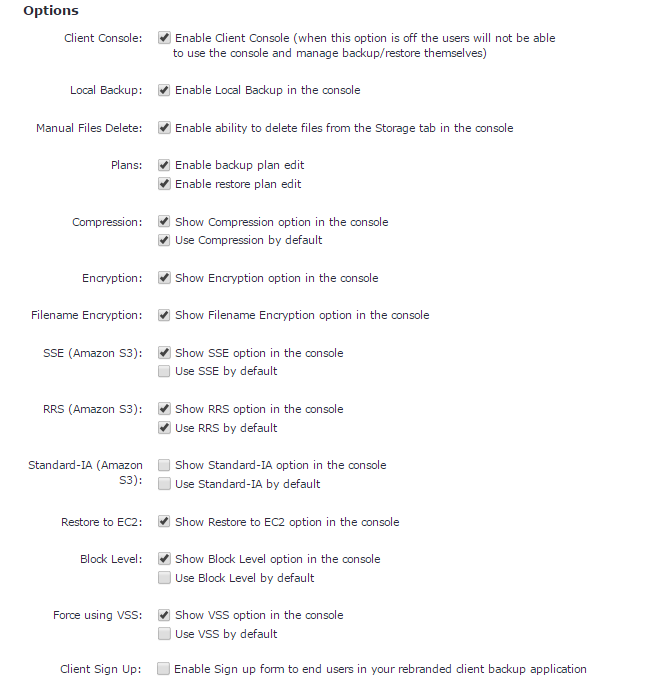 - Show RRS option in the console - this option enables RRS (Amazon S3 Reduced Redundancy Storage) option on the client. - Use RRS by default - this option sets RRS as a default storage for your customers. - Show Standard-IA option in the console - this option enables Standard-IA (Amazon Standard-Infrequent Access) option on the client. - Use Standard-IA by default - this option sets Standard-IA as a default storage for your customers. - Show Restore to EC2 option in the console - this option enables "Restore to EC2" option in the console. - Show VSS option in the console - this option enables "Force using VSS" option on the client. - Use VSS by default - this option sets "Force using VSS" option as default on the client. - Enable Client Sign Up - this option enables an ability to sign up directly from the client. 3. Prepare a rebranded build. Step 1. 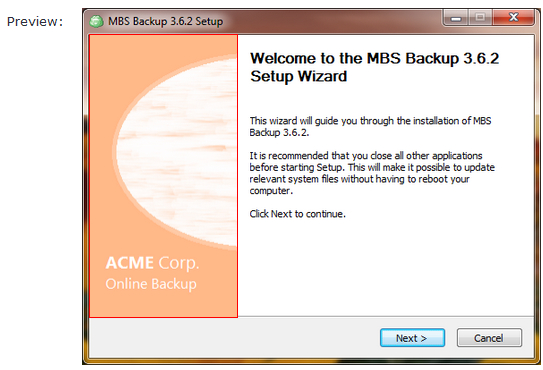 Go to the Downloads tab of the Managed Backup service control panel. Scroll the screen down until you see the "Rebranding Specification" box. Step 2. Optional: Download "Specification" and "Sample Graphics" files. The specification will provide you with information and recommendations for successful rebranding. The sample graphics can be useful for you or your graphic designer as an example or as a basis for your own Managed Backup client graphics. Step 3. 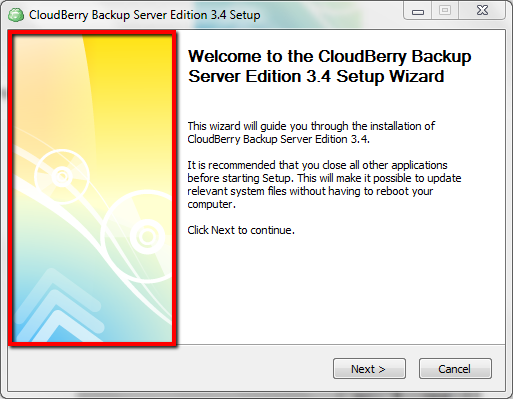 When brand images for the Managed Backup client is ready, go to the Advanced Rebranding tab, under Downloads. You will be redirected to the "Advanced Rebranding" screen where you will be able to upload your custom images and icons. 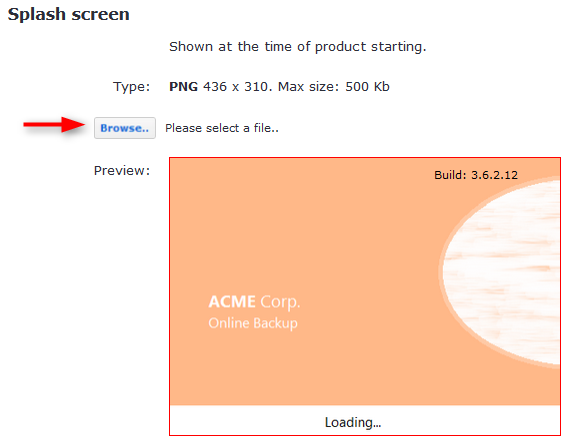 After selecting the image, you will see a preview of your customized backup client. Step 4. 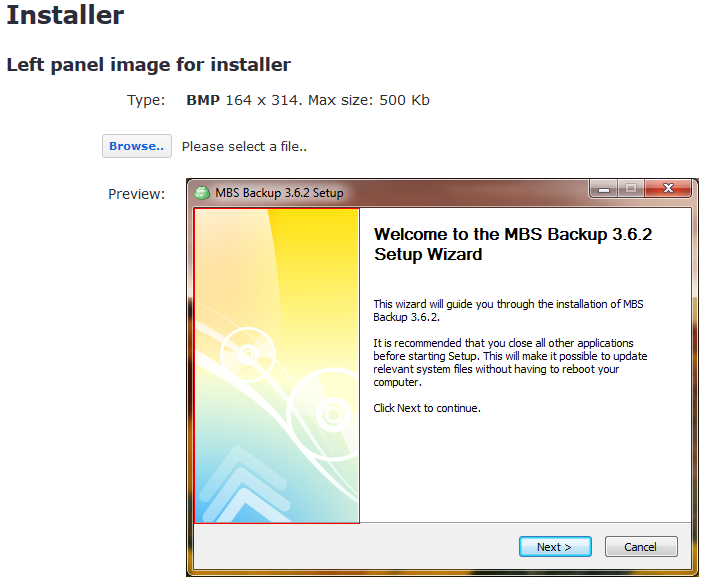 Click "Browse..." in the "Installer" box and select your custom image for the installer left panel. Step 5. 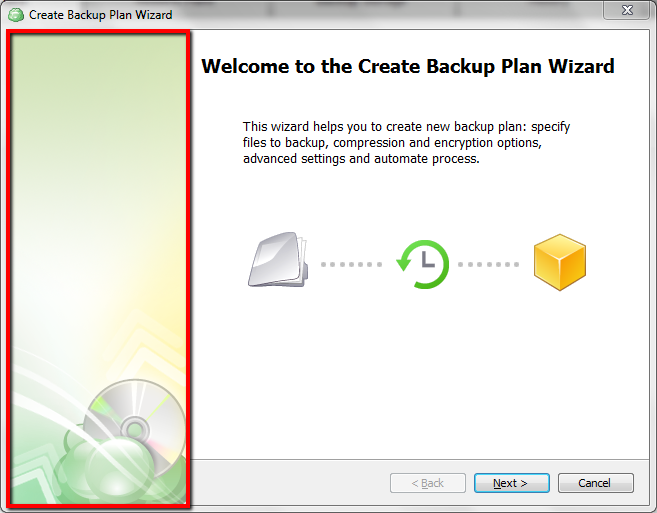 Click "Browse..." in the "Backup Plan Wizard" box and select your custom left image for backup and restore wizards. 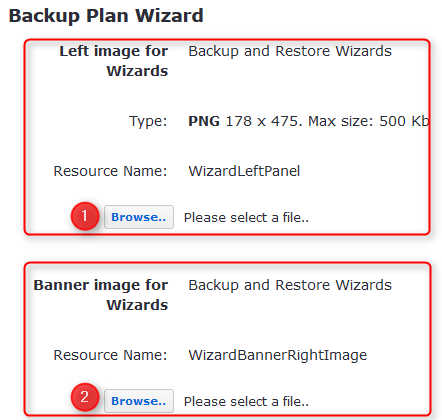 Click another "Browse..." button in the "Backup Plan Wizard" box to select your custom banner image for wizards. Step 6. Click "Browse..." in the "Icons" box and select your custom Tray icon. Click another "Browse..." button in the "Icons" box and select your custom Main icon. The uploaded icons become available for a preview. Step 7. 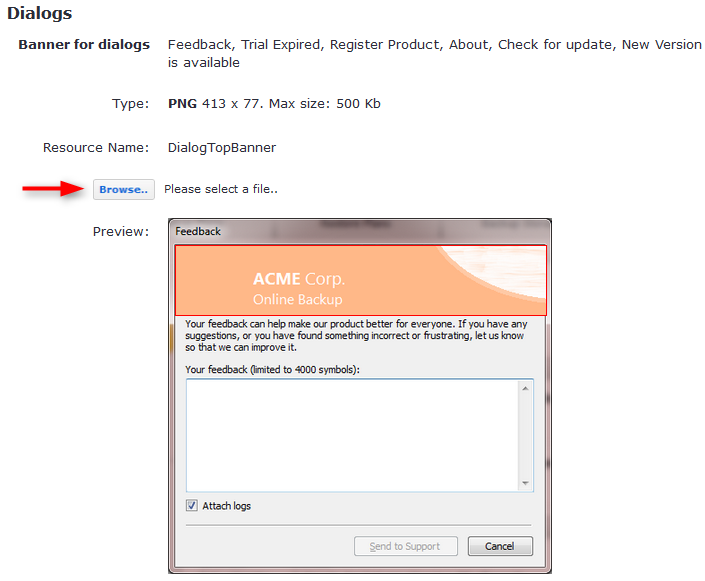 Click "Browse..." in the "Dialogs" box and select your custom Banner for dialogs. Look at the preview. Step 8. Click the "Browse..." button in the "Splash screen" box and select your custom Splash screen image. Look at the preview. Step 9. In the "Texts" box specify your Welcome Description, Web Site, Support Email, Copyright Text and Default Language. In the "Welcome Description" field you can write anything you want, however the default text is designed to ease Welcome Description customization. Step 10. In the "Options" box set the necessary rebranding options. Step 11. To finish the customization procedure, click the "Update Resources" button. 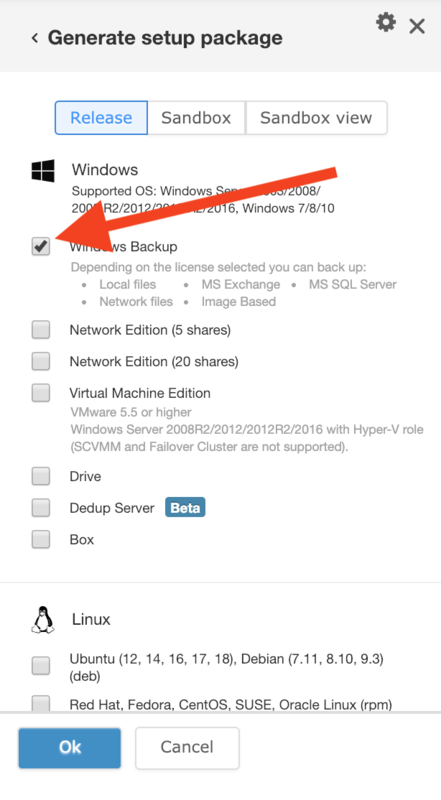 Now you can request a custom build of the backup client by clicking Get More on the Downloads slide-out panel. Select the checkbox next to the required build and click OK.
After you have marked such build as "public", your customers can download the backup client with your customized images, icons, texts, contact email, company name and product name. How To Create Provider ?